Foyer furniture , entryway furniture has now got redefined and redesigned , from the basic utility furniture to designer furniture , ethnic and contemporary. Decorative foyer tables now have table tops that could be of glass , ceramic , stone or good old wood surfaces. With patterns carved , embossed , painted or printed to add colour , drama or a certain concept to the entryway. Foyer décor is evolving. Most foyer furniture is placed strategically for enhancing the look of the entryway rather than for utility. Homes today have key-stands , hat-stands and mail-stands adorning different corners of the foyer , thereby making foyer furniture exclusive decorative pieces. Multi is the keyword today. Multi-tasking , multi-purpose , multi-faceted are all words coined or conjoined in our century to describe the complex web of human activities , all jostling for time and attention. Space is becoming sparse and there is a pressing need to make the best of the available space. Furniture that was once exclusive to specific portions of huge houses also needed to get versatile and easily movable. Thus came in light-weight compact furniture into our lives and homes. 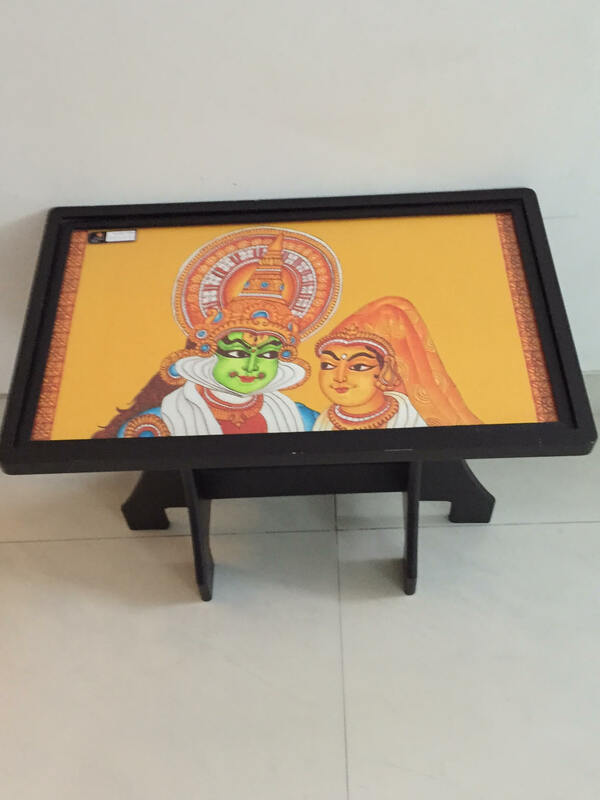 Look at these beautiful foyer tables from Mural Aura with Kerala mural art imprinted and encased , medium-sized so as to be movable. People today like to change the look of their rooms often and rearrange furniture to bring in freshness and variety. Transform them into coffee tables for the living room , side tables for your bedroom or family room , foyer tables for the foyer or just about decorative pieces even for office spaces. 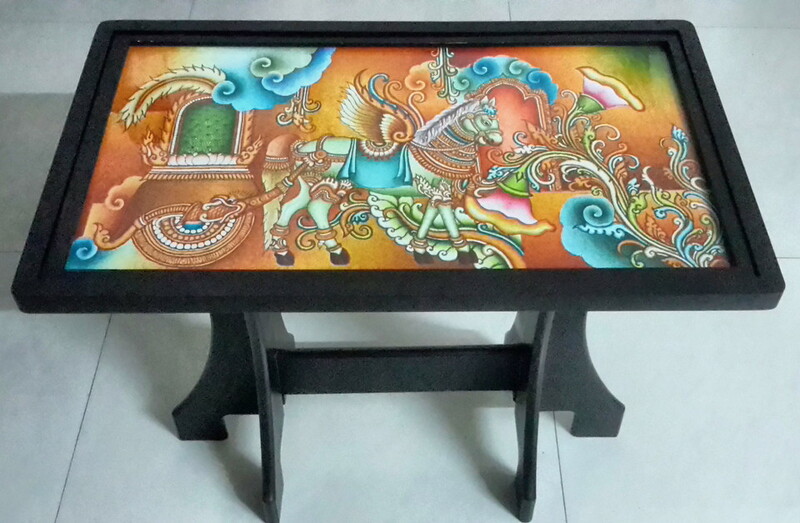 Material : Carved from MDF – medium density fibre-board and softwood , they are given a base protective coat and painted. The picture is encased within a 3 mm glass and secured by a fibre casing with adhesive , making it safe and sturdy. The picture within is a digital reprint on canvas , from a high-resolution scan of the original painting. 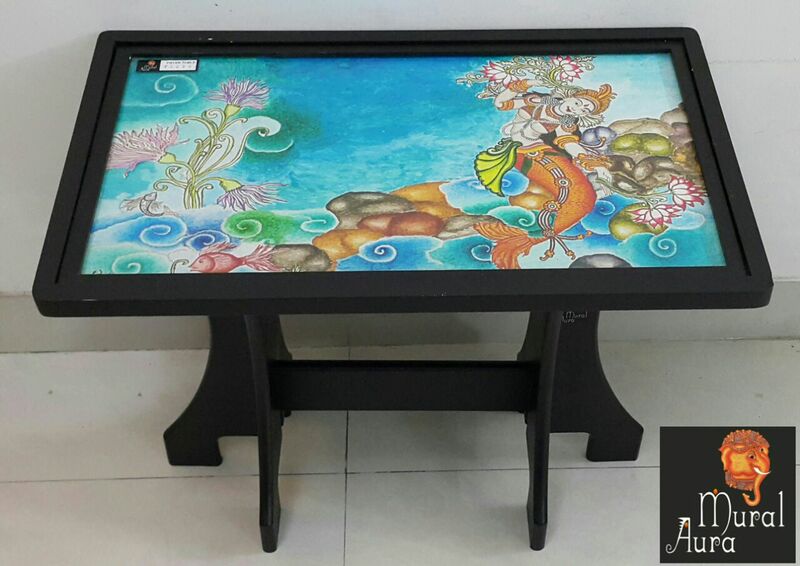 The Foyer Tables can be customised , can contain an original hand painted mural for a corresponding price. Great idea to buy a few foyer tables for a home. Move them around to change the decor of the rooms. Pair them , create a theme or just play around. Mural Aura’s Foyer tables are versatile home-decor pieces.